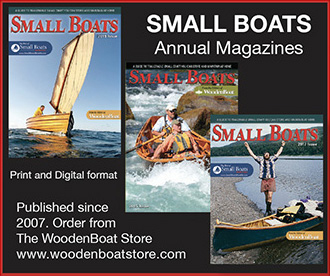 The postwar market of the 1950s saw a boom in the market for home-built boats. With such a high demand for construction plans, naval architect Glen L. Witt founded his company, Glen-L Marine Designs, in 1953. 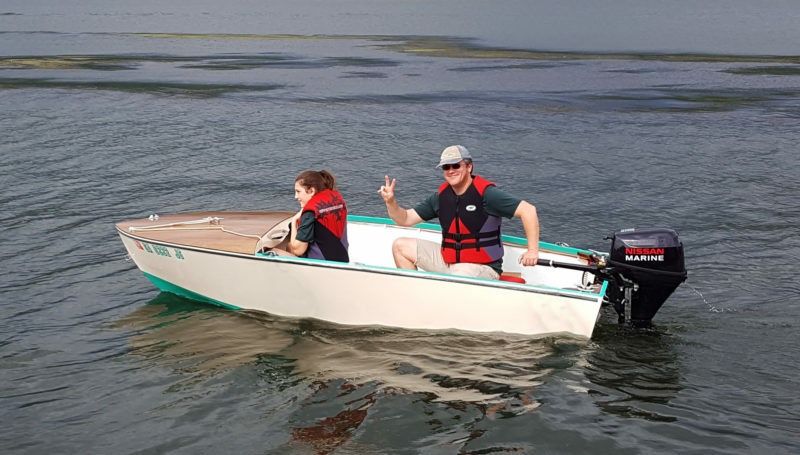 That fledgling enterprise offered both plans and frame kits, making it a competitor to the Kit Boat Division of the now iconic Chris-Craft brand. Although Chris-Craft closed down its Kit Boat Division in 1958, Glen-L Marine Designs remains. 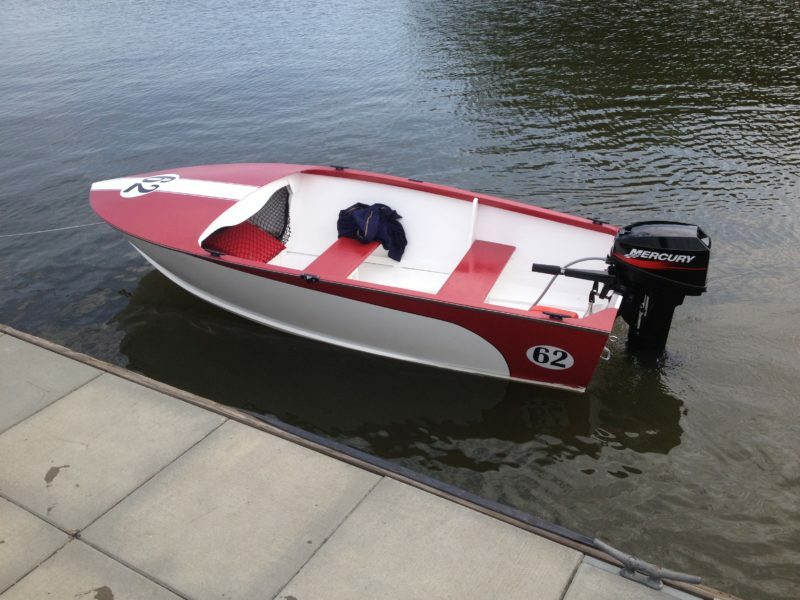 The Utility, a small general-purpose outboard, was designed in 1953 and is among Glen-L’s earliest designs. For over six decades, it has endured as a standard offering in the Glen-L catalog, and with good reason. It was specifically designed to be affordable and easy to build for the first-time, amateur builder. So it was then, and so it is now. A rank newbie with no woodworking experience whatsoever can build this boat. I know. I’ve done it. 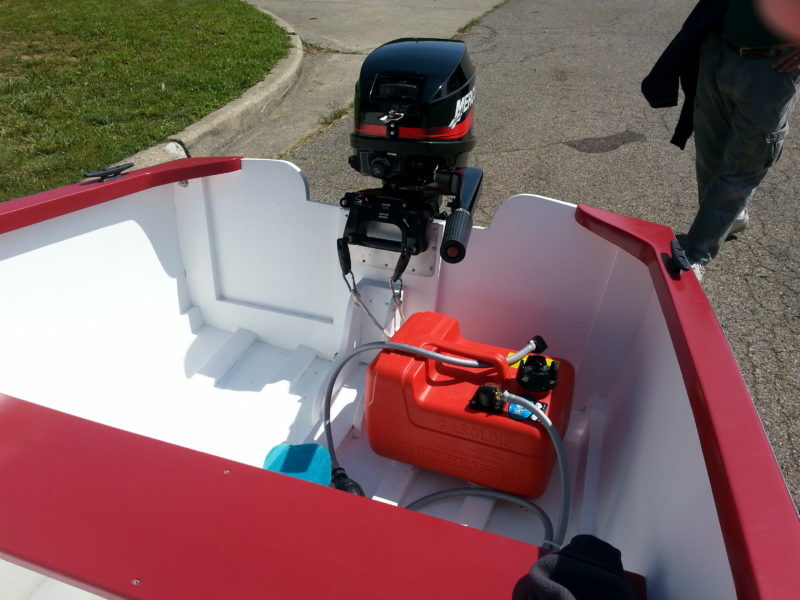 The boat is a planing hull intended for small outboard motors up to 15 hp. Its standard length is 11′, although the builder has the option of lengthening or shortening the hull by up to 10%—up to 12′, or as short as 9′ 7-1/2″. These variations are achieved with proportional adjustments to the spacing between the frames. The black hose and the wiring on the transom of the author’s Utility are connected to an automatic bilge pump. The battery is housed under the foredeck. An enduring representation of the era in which it was designed, the Utility features the characteristic curves and graceful geometry of 1950s boats. The sheer creates a sweeping curve from the broad foredeck to the narrow transom. The transom has gently curved sides that flare, ever so slightly, as they rise from the water. Typical of the era, the transom has a cutout to accommodate the short-shaft motors that were the norm of the time. Fortunately for today’s builder, new short-shaft motors are still readily available in this horsepower range. The Utility has a 5′ beam and a substantial flare in the forward section to give the hull added buoyancy and stability. As designed, the seating features a full-width thwart forward and benches aft along the port and starboard sides, though some builders omit these in favor of a second, transverse thwart. The plans for the Utility are unmodified reproductions of the originals. Full-sized patterns make lofting unnecessary, as the parts can simply be traced onto the wood. The boat is designed for plywood-on-frame construction, and, like most Glen-L designs, is constructed upside-down on a simple form. The frame pieces are fashioned from solid stock—mahogany and white oak are recommended—joined with 1/4″ marine-plywood gussets. There are only two frames between the transom and the stem, adding greatly to the design’s simplicity. The curved stem is made from two pieces of 3/4″ plywood laminated together. The breasthook is typical of Glen-L designs: it’s a large piece of laminated plywood—two layers of 3/4″ ply—notched around the stemhead and fastened to the sheer clamps. 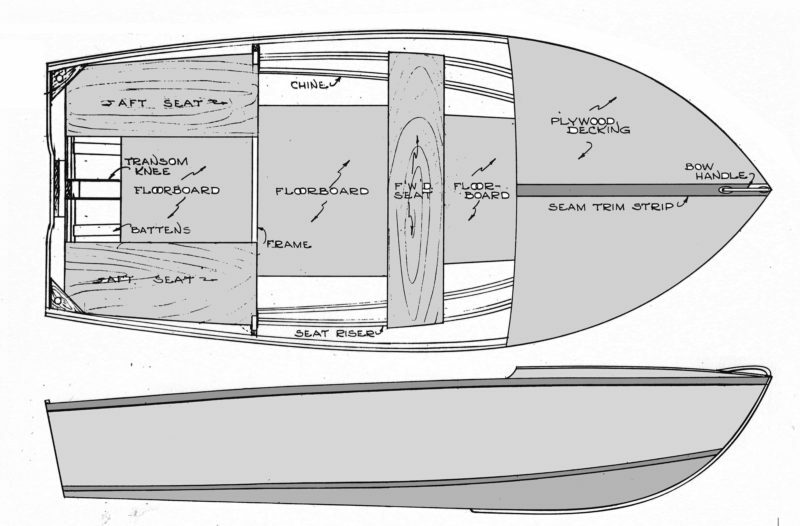 The forward frame includes a crowned deckbeam to support the aft edge of the 1/4″plywood foredeck. The aft frame is open at the top and its side members have small cutouts that are designed to accommodate full-length seat risers, though some builders omit these and install short risers just under the thwarts. The transom, set at a 12-degree rake, is 3/4″ marine-grade Douglas-fir plywood, with an additional outer layer of 1/4″ BS 1088 meranti plywood to match the deck if finished bright. Its perimeter is framed with of solid 1″ (nominal) mahogany. A rectangular reinforcement is attached to the inner surface of the transom, centered under the notch for the motor. I used mahogany for this “motor board,” though oak is also recommended in the materials list. Chris Atwood clocked his 11′ Utility at 24.2 mph with two adults aboard and a 8-hp, two-stroke outboard running wide open. His boat stays on plane down to 13 mph. The transom knee is somewhat unusual in its design. Rather than having a single knee bolted to the transom and keel, the Utility has twin plywood knees fastened to either side of the keel. A piece of blocking, the same width as the keel, is attached to the centerline of the motor board, and the knees are fastened to the sides of the blocking. Altogether, it provides a strong structure to support the outboard motor. The keel itself is made from 1″ stock with a layer of 1/4″ plywood laminated on its top. The 1×2 floor battens are set at toed-in angles from the transom to Frame #2, rather than parallel to each other. The inner floor battens pass through the frame; the outer ones end just shy of it, getting beveled and twisted to lie flat on the plywood bottom when installed. Sheer clamps and chine logs are sprung into place, fitting into notches in the frames. White oak is the preferred material for the chines and sheers; I substituted southern yellow pine. It bends easily and is very strong and here in Georgia, the stuff grows like weeds, so it’s plentiful and dirt-cheap. The downside is that it’s soft. With a hull weight of just 140 lbs, the Utilty is an easy load to trailer behind a compact car. This boat is built without the full-length risers noted in the plans. After fairing the longitudinals and framing, 1/4″ plywood panels are attached to the sides and bottom to create the hull. The plans call for Douglas-fir exterior AB plywood, which was commonly used for boatbuilding when the plans were first created; I used BS1088 meranti plywood. Fiberglassing the entire hull or just the seams is optional, but recommended. Once ‘glassing is completed, builders can add spray rails and a 1/2″ oak false stem, though some omit them, as I did. Once hull construction is completed and the boat is flipped over, the interior can be finished. I deviated from the plans only slightly, opting for a second thwart aft, rather than the twin side benches. The plans call for two side benches in the stern, but this Utility has a second thwart instead. It helps keeps the helmsman’s weight centered. The plans do not include dimensions for an intermediate deckbeam between Frame #2 and the breasthook. This is left up to the builder to determine, taking measurements from the partially finished boat. Copying the crown of Frame #2’s deckbeam provides a very good starting point. The intermediate deck beam is attached to blocking that is secured on the inside face of each sheer clamp. Once this is in place, the 1×5 centerline carlin is installed from Frame #2, passing through a notch in the intermediate deckbeam, to the top of the breasthook. The deck framing is faired, and then the deck is installed as two panels joining along the centerline. The plans include optional accommodations for oarlocks. The author’s Utility gets up on plane with an 8-hp outboard and two aboard. For heavier loads, a 9-hp motor would be a better fit. I found the Utility to be surprisingly stable, given its small size. It does roll a little bit side-to-side so I prefer to fish sitting down. However, the wide flare at the front of the boat does a superb job of providing ample buoyancy at the front of the boat and I feel comfortable leaning over the side to, say, retrieve some item from the water. The wider V-shaped sections there resist being pushed downward into the water as the boat rolls or leans. While the boat gives me a lot of confidence in doing this at the forward thwart, I would not attempt a strong lean at the stern, as the sides there are lower and almost vertical, and don’t offer the same degree of reserve stability. Being only slightly rounded through the middle and almost flat-bottomed at the back, the Utility is certainly not a rough-water boat, and it’s a roller-coaster ride in chop. It can, however, handle boat wakes and moderate chop with confidence. An 8-hp outboard provides plenty of power and agility with only one passenger aboard. The very first time I made a full-throttle run, I was pleasantly surprised when the bow quickly eased back down as the boat came on plane. 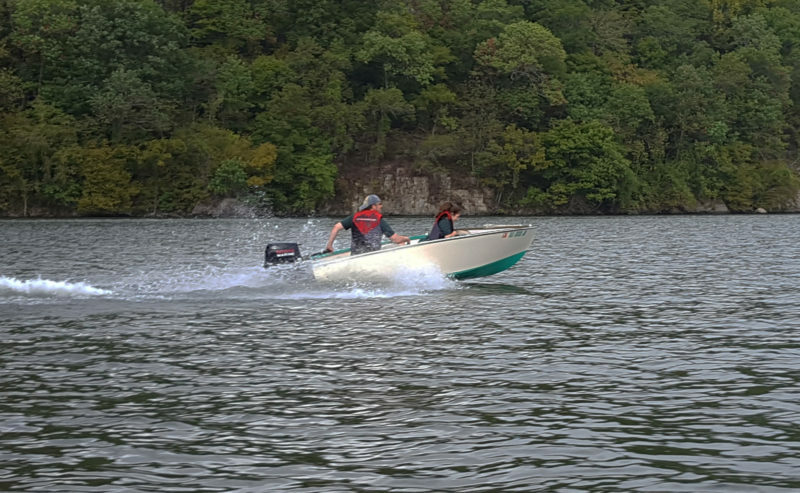 With one passenger, an 8-hp motor propels the boat about as fast as a boat its size needs to go. With two passengers, however, the boat is somewhat under-powered with and 8-hp outboard. A 9.9-hp motor would be better. I have ridden in a 12′ version with a 15-horse, and that is about perfect for the longer hull, especially with two aboard. 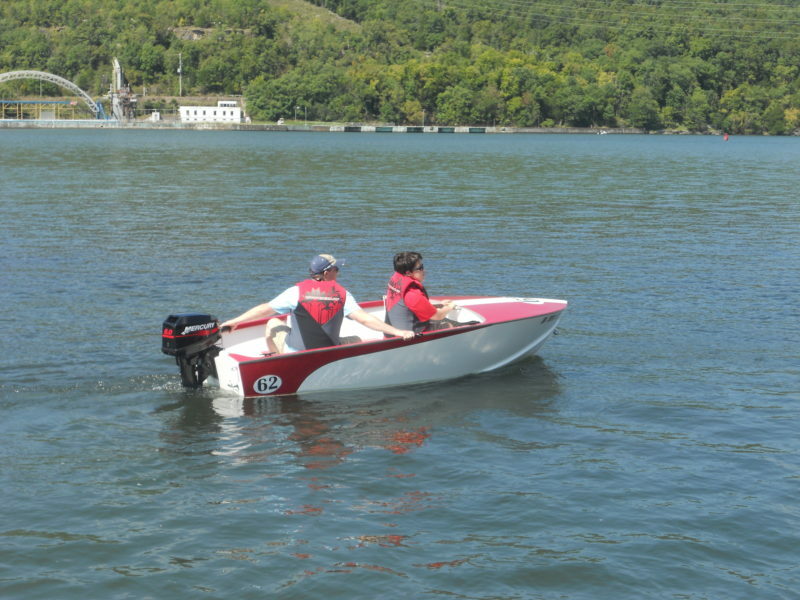 A 15-hp on an 11′ or shorter version of the Utility might be more than the boat could safely handle. The author powers his Utility with an 8-hp four-stroke outboard. It didn’t perform as well with two adults aboard as Atwood’s two-stroke 8-hp did. For a first-time builder, the Glen-L Utility is plenty easy to build. Trust me, if I can build this boat, anybody can. It offers a tangible link to the graceful designs of the past, while fitting within a modest budget. 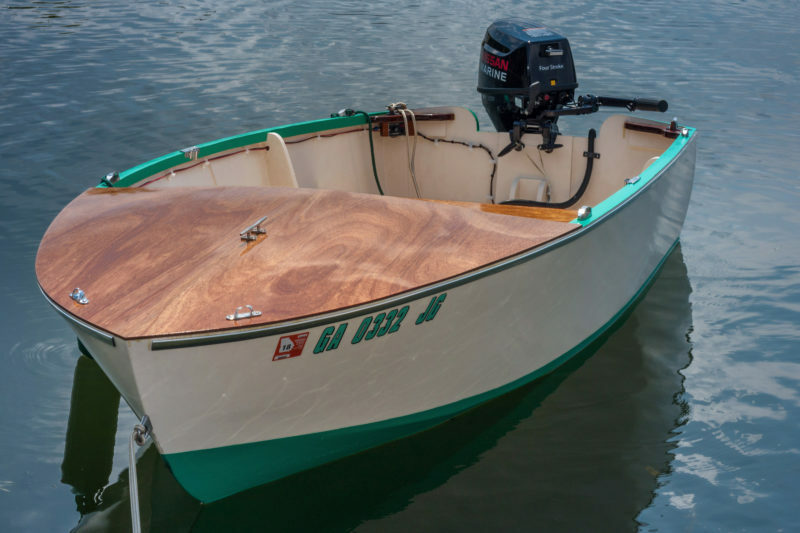 Building a Utility in your garage brings to life the curving, elegant simplicity of 1950s-era design and all in all, it’s an eye-catching boat that you’ll be proud to say you built yourself. Michael Maddox was born and raised in Georgia, where he still lives. He’s a single father of two who works in industrial advertising. As an adolescent, his interest in wooden boats was sparked by the Venice boat-chase scene in Indiana Jones and the Last Crusade. He had gone to see the movie with his dad, and until that scene, he had never seen a wooden motorboat. A decade later, his fascination with them was cemented during a trip to northern Italy. He was more enamored with these mahogany motoscafi (water taxis) than some of the destinations they ferried him to. He has wanted one ever since. A few years ago, he discovered the world of boatbuilding, and was hooked. 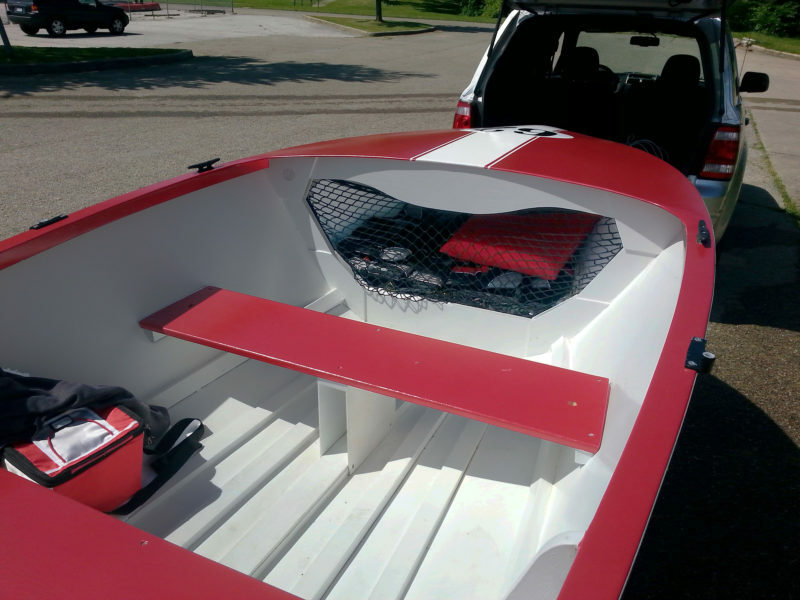 He is currently building his second boat and records his progress on his blog, Barnacle Mike Boats. Plans, with patterns, for the Utility are available from Glen-L for $70.